On Sunday 19th June one of our fantastic volunteers undertook the Guernsey Dairy Half Marathon and helped raise funds for the many animals at the GSPCA. After her run Aoife Bennett said "Hi All, I did it!" "Not quite 2 hours, but I ran all the way!" "I did it in 2 hours 25 minutes and I am really, really pleased!" 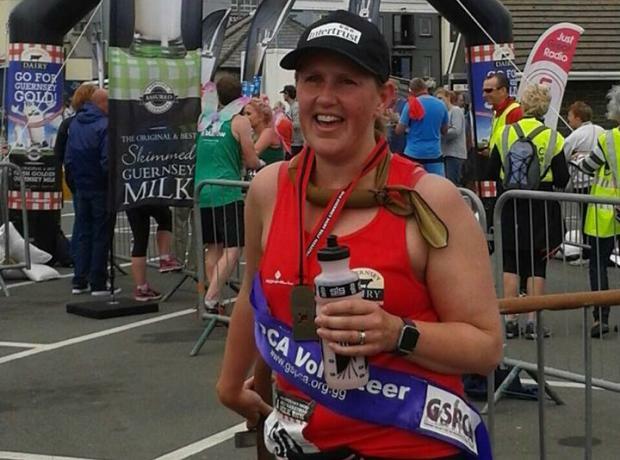 Steve Byrne GSPCA Manager said "Aoife did so well yesterday at the Guernsey Dairy Half Marathon and has raised an amazing £1,170 so far." We are pleased to announce that Aoife and Mike are up to £1.051 raised towards their upcoming challenge and continue to appeal for your support. On the 19th June they will undertake the Guernsey Dairy Half Marathon and are raising funds to help the many animals at the GSPCA. Steve Byrne GSPCA Manager said "Aoife and Mike popped in to see us in February for a chat and it is wonderful that they have chosen the GSPCA as their charity of choice with what I am sure will be no easy challenge." We are pleased to announce that Aoife and Mike are up to £481 raised towards their upcoming challenge and continue to appeal for your support. Here is a write up from Aoife Bennett an amazing lady who with Mike Meinke are taking on a challenge to raise funds for the many animals at the GSPCA. Following a long recovery as a result of breaking two bones in my back in 2009, it has been a challenge to maintain a steady level of fitness. Later in 2014 I contracted a viral infection that seriously affected my balance called Labyrinthitis, which meant no exercise for a further 6 months. So what has kept me going? Michelle Rogers from the Pet Cabin in less than 7 weeks will be running the Half Marathon in aid f the GSPCA and Sarnia Guinea Pig Rescue. Her training is going well but she is appealing for sponsorship to help raise lots of money for both the local animal charities. You can sponsor Michelle by popping into the Pet Cabin on the Grand Bouet or call 01481 711971. We would like to thank Michelle and wish her luck in her half marathon.